Public awareness of the respiratory risks of Valley fever infection and beyond will get two big boosts in March with a billboard campaign in the Phoenix area and a Tucson Lifestyle magazine article for its monthly “In Health” feature. The billboard campaign will begin March 4 with a billboard on Interstate 10 between Guadalupe and Elliot Roads and another at the Arizona 101 and Arizona 202 Loop interchange. It’s sponsored by the University of Arizona Valley Fever Center for Excellence, Arizona Department of Health Services (ADHS), and Maricopa County Department of Public Health with financial support from IMMY, a company based in Norman, Okla., that manufactures diagnostic tests for detection of a range of fungal diseases including Valley fever. Valley fever, also known as coccidioidomycosis or cocci, is a disease that results from inhaling fungal spores found in the soils of the U.S. Southwest. Common symptoms are respiratory distress similar to those caused by flu or bacterial pneumonia. Because the illnesses are so similar, many cases of Valley fever are incorrectly diagnosed and treated with antibiotics, which are of no help. For some, the unrecognized illness can move past the lungs and become life threatening. Raising awareness of Valley fever and promoting proper testing for faster recognition is part of the mission of the Valley Fever Center for Excellence, created by the Arizona Board of Regents in 1996 at the University of Arizona in Tucson and led since then by John N. Galgiani, MD, as founding director. Dr. Galgiani noted that the billboard campaign was made possible by an unrestricted education grant from IMMY to the UA Foundation. Messaging was coordinated through the VFCE, Kenneth Komatsu, MPH, state epidemiologist with ADHS, and Rebecca Sunenshine, MD, medical director for disease control at Maricopa County Department of Public Health. UA Brand Resources and UA Health Sciences Biocommunications also contributed. 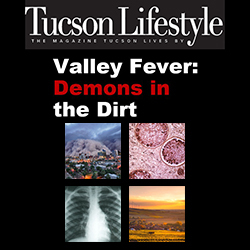 The Tucson Lifestyle article — look for it in the March issue — focuses largely on a recently released UA/Banner Health Valley Fever Clinical Practice Toolbox and tutorials available to help clinicians better identify Valley fever in their patients more quickly, whether those patients are people or animals. Another aspect of the center’s work involves research to develop a vaccine to prevent Valley fever. In the magazine article, you’ll find an update on that work both for a vaccine for dogs and efforts to get Nikkomycin Z, an antifungal/antibiotic for humans, back into clinical trials for humans. Other research focuses on identifying possible genetic reasons why Valley fever affects some differently — with African Americans more likely to suffer from disseminated cocci (the more severe form that spreads beyond the lungs), for instance — and to develop precision medicine therapies to address that. The toolbox, though, was created through a protocol development process at Banner Health and is targeted at primary care physicians who are the first line of defense from a clinical perspective. Dr. Galgiani and Fariba Donovan, MD, PhD, are traveling to 39 Banner Health primary care facilities to offer physician training seminars on the new clinical practice. It is available publicly as well to all physicians at the link above.